Udham Singh was born in Sunam in Sangrur district of Punjab in 1899. After his father’s death at a young age he was raised in an orphanage in Amritsar. 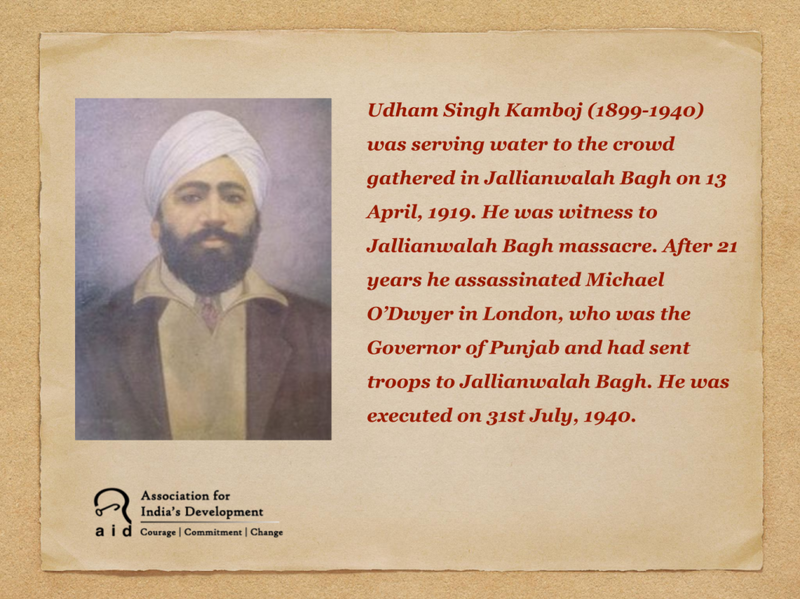 He had just finished his matriculation when on 13th April, 1919 Udham and his friends from the orphanage were serving water to the 20,000 people who had gathered at Jallianwallah Bagh to protest against the Rowlatt Act and the arrest of Satya Pal and Saifuddin Kitchlew. It was also the day of Baisakhi. The Governor of Punjab, Michael O’Dwyer dispatched troops under the command of Brigadier-General Reginald Dyer who ordered the troops to fire without warning on the gathered people at Jallianwallah Bagh. 1800 people were killed and 1200 wounded in the Jallianwalah Bagh massacre. This had a deep impact on Udham Singh. He became inspired by Bhagat Singh and got involved with the Ghadar Party, organizing Indians overseas to overthrow British rule. He spent 5 years in prison for his anti-British activities. In 1934 he went to London and worked as an engineer. On 13th March, 1940 Michael O’Dwyer was scheduled to speak at a meeting. 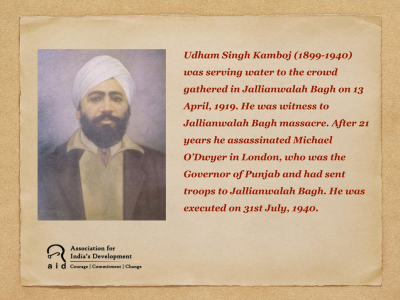 Udham Singh shot and killed Dwyer at the meeting. He was arrested and tried in court. He went on a 42 day hunger strike as he waited for his trial. He was convicted and sentenced to death. On 31st July, 1940 Udham Singh was hanged. Udham Singh Nagar, a district of Uttarakhand was named after him in 1995 by the erstwhile state government.